One of the first things to do is to prepare your lab environment. This, at first, was pretty complicated for me (probably because I was overcomplicating it), but it really isn’t too hard. There are a few things that you need to do, however, if you want performance and reliable networking from within your nested lab. The first thing I’ll go over is VMware Workstation configuration, and from there I’ll go in to the next post with getting your lab domain (Active Directory) set up. I’m going to assume that you have all the requirements I said in the first post (Quad Core processor or better, preferably i3, i5, i7, 32GB of RAM, SSD / RAID / HDD of about 200 – 400GB, with VMware Workstation installed). The screenshots are from my little lab setup and are, as I said, on a DL360 G5 running Windows Server 2012. Incidentally, you don’t need much on your lab host, I stuck VMware Workstation, the .NET Framework 2.0 feature (not really sure if this is a requirement, I did this more out of habit) and a web browser (preferably Chrome, but FF will work too, the only reason I say Chrome is preferable is because it has embedded Flash support – this is especially important if your host is going to be your Control Station). So, on to Workstation. First, you’re going to want to change where your VMs are stored on to your faster / separate storage. If you are lucky enough to have your OS installed on a 1TB SSD, I guess you can ignore this part, but for those who are wanting their VMs installed on separate storage, this is for us. Under “Workspace”, choose a folder on the drive you want your VMs stored. As you can see in the screenshot, mine are going to be stored on the V:\ drive in a folder called VMs. Creative, I know. Click “Ok”. That part is done. Next is the networking – I had some trouble with this at first because I was determined to make it harder than it really was. For the most part, the NAT adapter is all we will need (we will NOT be doing physical VLANs or anything like that in this particular lab, since this is basically a “lab in a box” and I am using a dumb physical switch). 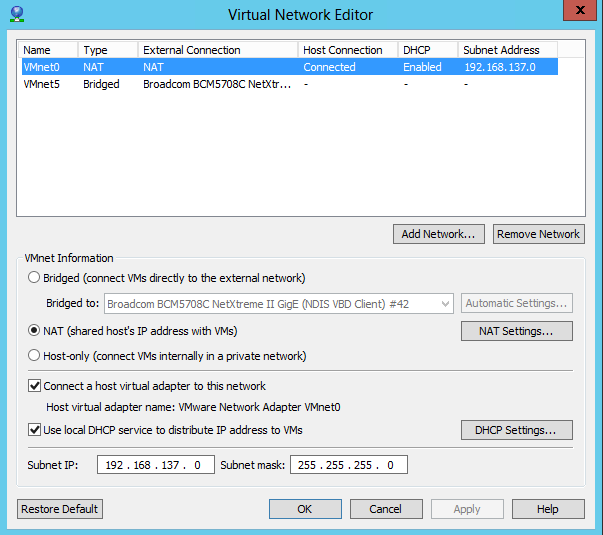 Add a new network by clicking “Add Network” and choose “VMnet0”. It doesn’t have to be VMnet0, it can be any number you like, but the purpose of this, I’m going to assume you did VMnet0. Once it is created, choose NAT as the network type. Next, make sure that “Connect a host virtual adapter for this network” checked. DHCP is totally optional. I left it enabled just so when the VM first powered on, it would have an IP. I’ve read some people say turn it off, but I guess I don’t really care that much if it’s on – as long as you know that you’re going to end up static IPs anyway for your VMs. Next, choose your subnet. For this particular setup, I’m going to be using 192.168.137.0/24 for LAN and 192.168.147.0/24 for iSCSI / Storage. You can only have 1x NAT VMnet per host, so you really only need one. You’ll see that I also have a bridge adapter as VMnet5 – this is for my Control Station – I wanted that on dual subnets so that I could RDP from my regular network from a different computer. If you plan on doing it that way, just bridge one of your adapters in your computer / server that has physical access to the network. Click ‘OK’. That will about do it for now. This is just about all it took for me to get my configuration rolling. I’ll get to getting some VMs up and running next – the next thing you’ll want on your lab network is a domain controller. You’ll hear me refer to it a lot as a DC, so if you see me mentioning something about a DC, just know that I’m talking about a domain controller.